Acts as an injector cleaner which can provide longer component life. Diesel Power Plus also helps in reducing smoke and emissions along with combustion noise. It has been extensively tested both in the laboratory and in the field with impressive results improving fuel economy and power in almost all diesel vehicles. Just add 30ml to every tank of fuel every time you fill up for maximum performance or once every month for optimum power & economy. 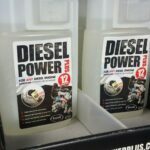 It’s extra concentrated so one bottle of Diesel Power Plus will last you 12 months (when added monthly). Pick your bottle from us for just £15.95! !